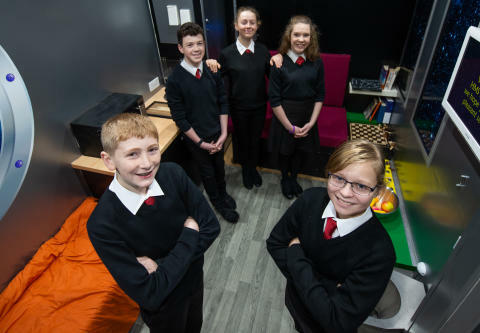 A SPACE prison escape room has been brought to life at Elgin Academy, following pupils’ national competition success. Primary and secondary pupils taking part in the escape room experience will have to solve maths puzzles to get out. The design of the escape room replicates the pupils’ entry into the Cracking the Code competition, run by Nesta, in partnership with Tata group and Tata Consultancy Services (TCS). Pupils were asked to design their own ‘crystal maze’ style escape room by coming up with a storyline and a series of maths puzzles that must be solved to get out. The team were crowned winners at an event held at The Crystal in London in June, where nine teams of finalists presented their escape room designs to a panel of judges. 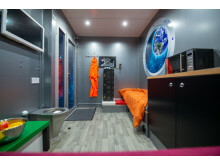 HMS Supernova, a group of S2 and S3 pupils, set their escape room scenario in a space prison of the future, where prisoners are held and then ejected out into space. Having been framed for a crime, the escape room player must solve the puzzles in time in order to avoid being lost in space forever. Their design has now been turned into reality with the help of the Problem Solving Company. 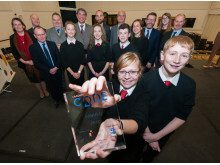 The Cracking the Code competition is a part of the Maths Mission, a series of pilots seeking to find the most effective ways to increase young people’s interest in maths, and improve their collaborative problem-solving skills. In its first year, 118 schools registered for the competition from across the UK, with 400 students participating, consisting of 41% boys and 59% girls. Lynne Weir, Elgin Academy’s Principal Teacher of Mathematics, said: "To believe and try something new and different is courageous and makes me extremely proud of Josh, Carrie, Kelly, Jonathan and Lexi. Very much an innovative and hardworking team, they are a credit to the Academy and their families. This is an exciting opportunity for all our young people to realise that if they work hard, there are great rewards out there."